We love pizza! Who doesn't love pizza? 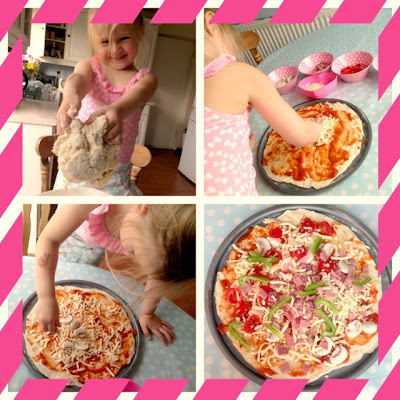 Homemade pizza's are one of Sienna's most favourite things to make. This pizza dough recipe from Jamie Oliver is surprisingly easy to do and you will never buy premade bases ever again. This is a lot of fun to do with the kids and they will love being involved in making dinner. Sienna likes having lots of separate bowls with her pizza toppings in to choose from. You know how pizza toppings go its not rocket science, a bit of tomato cheese and whatever else your heart desires. Just a quick note the recipe makes 6-8 pizza bases so if your not having the street over for dinner you might want to halve the quantities. So heres the recipe, enjoy! Timing-wise, it's a good idea to roll the pizzas out about 15 to 20 minutes before you want to cook them. Don't roll them out and leave them hanging around for a few hours, though – if you are working in advance like this it's better to leave your dough, covered with clingfilm, in the fridge. However, if you want to get them rolled out so there's one less thing to do when your guests are round, simply roll the dough out into rough circles, about 0.5cm thick, and place them on slightly larger pieces of olive-oil-rubbed and flour-dusted tinfoil. You can then stack the pizzas, cover them with clingfilm, and pop them into the fridge.